Oh my goodness how have I not used oats before in my raw desserts! This recipe has changed the game, I am in love with raw oatmeal cookie balls. They are so versatile, and can still involve nuts, but have this chewy, sweet, oatmeal cookie edge to them that make you want to keep popping them in your mouth! And did I mention they are still healthy? Vegan, raw, gluten free (I use gluten free rolled oats from Trader Joe's), soy free, refined sugar free, and full of healthy fats, protein, vitamins and minerals! I wish I could say I made this amazing discovery, but I owe this recipe to another lovely vegan food blog, The Simple Veganista, and her recipe here! Below is my slightly modified version. Combine all the above ingredients in a food processor, and blend until crumbly and sticky. Add a teaspoon of water at a time until a sticky ball is whirling around your food processor bowl. Scoop rounded spoonfuls of the raw cookie dough into your hand and roll into balls. 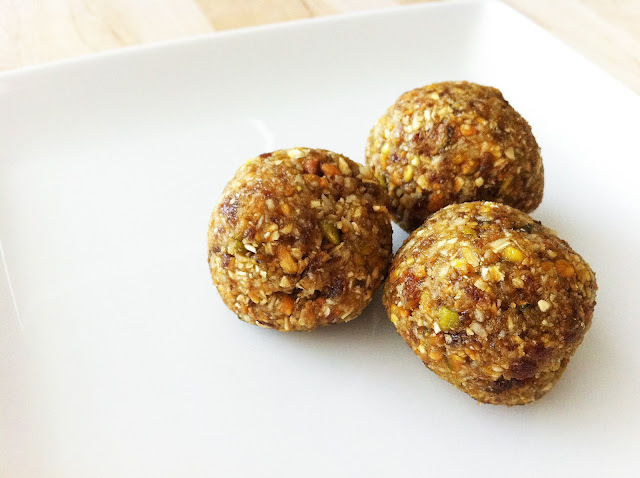 Place the cookie balls on a plate in the freezer to set for 10 minutes, then transfer to an airtight container and keep in the refrigerator until ready to eat! I love that you added pistachios to no-bakes! What a yummy idea! Aw thank you Alaine! I definitely have to give credit to The Simple Veganista for giving me the idea! I just made these and they are really yummy! I have a lot of similar bite-sized treat recipes and this is definitely one of my favorites. Thanks for sharing. How wonderful! So glad you loved them. And thank you for your feedback! Always good to hear what people think when they try my recipes :) glad this one was a winner!